Imagine if the most powerful Internet company — one that handles 100 billion searches for information a month — prohibited everyone except for the world’s largest e-commerce store to advertise for a specific product. What would that look like? It would look like this. Above is a screenshot for the search term “throwing knives,” one of our most popular categories at Knife Depot. We used to to run Google AdWords for throwing knives, but in May, Google turned off all ads for the search term “throwing knives” after they designated it a weapon. Obviously, we disagreed with such a characterization, but weren’t surprised, as in March Google had prohibited all ads for “Assisted Opening Knives” and canceled our entire AdWords account because we sold completely legal spring-assisted knives. Yeah, you guessed, Amazon is in the house, joined by Walmart and Cabella’s. It’s a mega-brand menage-a-trois, with poor Knife Depot relegated to the sideline. If you looked a year ago, there would have been probably close to a dozen sites advertising for this term. Now, it seems that Google has managed to successfully eliminate all advertisers except for their big-spending compadres. Why does Google Apply Its Adwords Policy Unfairly? The knife, in case you’re not aware, is the world’s oldest tool. It’s been around for close to 3 million years and is suffused in cultural and historical significance. At Knife Depot, we’re proud to be able to offer an inventory of 10,000 knives to customers across the U.S. and abroad. It’s a product we cherish and believe in. Our customers use their knives everyday in a wide array of capacities. Whether they’re hunters or fisherman, outdoorsman or collectors, their relationships with knives are built upon a love for craftsmanship, self-reliance and the outdoors. In March, I wrote about our battles with Google’s AdWords program, in which our entire account had been shut down due to the fact that we sold completely legal assisted-opening knives that were never prohibited in Google’s AdWords policy. At the time, we didn’t expect to ever be able to advertise with Google again, however, we had our account re-activated in May with the caveat that none of our landing pages could have assisted-opening knives on them. Then, just this month, our AdWords account was once again shut down without any advanced notice. We were informed that Google considered “throwing knives” to be weapons and we could not run any ads to those pages. Wait, a throwing knife is a weapon? The characterization of throwing knives as weapons, was of course, news to us and anyone who has ever used a throwing knife before. Every throwing knife we sell has been designed for hitting bullseyes, not bodies. Could you injure someone with a throwing knife? Sure, in the same way you could injure someone with a baseball, a frying pan, a brick, a bottle, a rabid cat or a slew of other projectiles that can become weapons if paired with malicious intent. However, a throwing knife is poorly suited for criminal activity. These knives are generally large, making them hard to conceal; they have blunt edges and they’re damn hard to throw with fatal accuracy. I mean, let’s be honest, are you really going to be more afraid of a guy like this trying to rob you then someone with a chainsaw they bought at Walmart? So, we couldn’t run any more ads for throwing knives, but neither could any of our competitors. And, at least, we still had Facebook, arguably the world’s most robust platform for demographically-targeted advertising, to alert our legions of knife fans to our products. Since we couldn’t boost our posts, we recently started running Facebook ads via a pretty badass company called Ad Roll. But before we could even get cranking, we received notice from Ad Roll that our ads had slashed by Facebook’s anti-knife policy. So I have some less than pleasant news for you. It looks like Facebook is following suit with Google and tightening their policies. We are going to have to take down the current facebook ads and (and the news feeds ads which never got started) which is a total bummer. I have had our ops team trying to push them through anyway, but we’ve hit a brick wall with it. A knife isn’t a weapon; it’s a tool, and one that saves lives every year. Just last week, in the tragic plane crash in San Francisco, police officers tossed utility knives to passengers so they could cut themselves out of seat belts. On this blog alone, we’ve chronicled dozens of incidents in which knives have saved lives. If Facebook wants to criminalize knives, why stop there? Why not restrict advertising for golf clubs, one of which was used just last week by a man who bludgeoned a woman to death in Arizona. How about baseball bats? Earlier this month, a deranged man killed a homeless man with one in a sporting goods store in California. The bottom line is that there are hundreds of products that can be used for malicious crimes if the person who owns them is hell-bent on destruction. Most of the anti-knife reaction by Internet companies unfortunately mirrors much of the anti-knife hysteria that exists out in public. At Knife Depot, we’re proud to support organizations like Knife Rights and the American Knife and Tool Association, which lobby on behalf of knife owners. If you want to cut away at anti-knife sentiment, consider donating to either of these two organizations. You can also share this blog post to alert others to the anti-knife policies of companies like Facebook and Google. Thanks for being a Knife Depot fan and rest assured we’ll never back down on our commitment to selling top-quality knives, no matter how much discrimination our product faces. This is the first of a two-part series with survival expert Creek Stewart. Tomorrow, Creek will be sharing his tips on picking out the perfect survival knife. We’ll also be giving away a BlackBird SK5 — Creek’s primary survival knife — to one lucky reader along with two copies of his book. Scroll to the bottom of the article to learn how to enter. A few minutes of conversation with Stewart, who founded and operates Willow Haven Outdoor survival school in Indiana, quells any doubts about his survival chops. 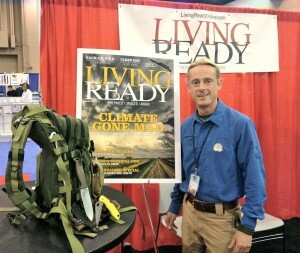 The former Boy Scout turned survival guru and bestselling author rarely goes anywhere without his “Get Home Bag,” a pack full of items ranging from energy bars to a Leatherman that ensures he’ll get home safely if disaster strikes. At the Blade Show, he was wearing a BlackBird SK5 in a leather sheath on his hip and also had a Leatherman and a Spyderco knife in tow. But what makes Stewart stand out from the pack isn’t his gear, but his survival philosophy. It’s a blended approach, which he calls “prima-modern,” that utilizes both modern tools and primal survival skills to meet the four core basic needs: shelter, water, fire and food. 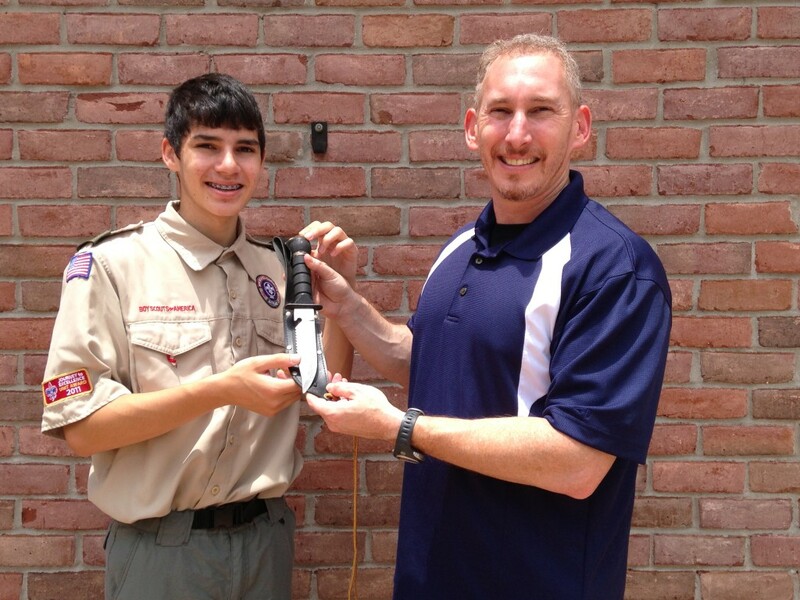 An Eagle Scout at 14, Stewart grew up on a farm and developed a strong appreciation for both nature and self-reliance skills at an early age. 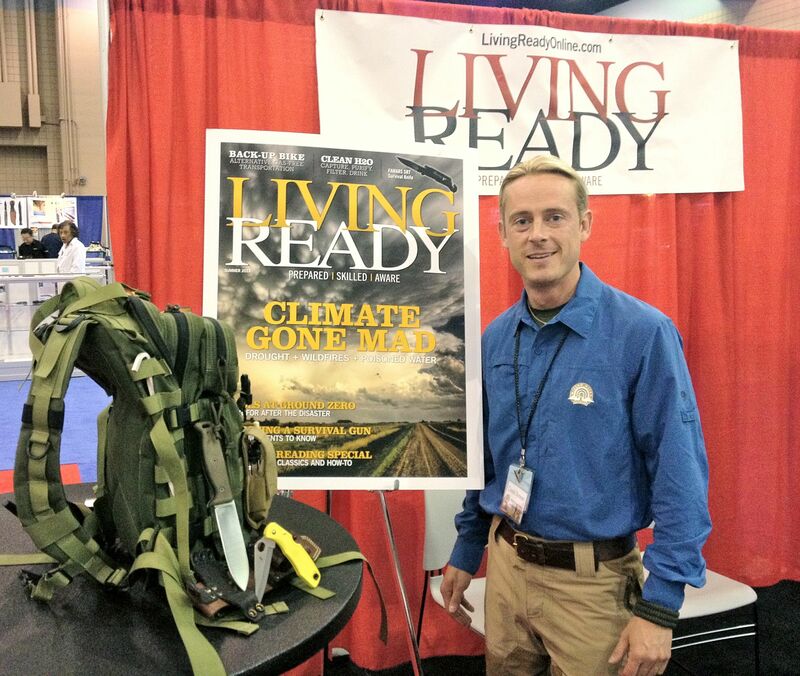 When he was in college, he wrote and self-published a guide on survival that he sold to the Boy Scouts. He began teaching survival courses at 21, but without a full time facility was limited to mostly one day courses in his area. Then about 4 years ago, he purchased Willow Haven Outdoor, a 21-acre survival school replete with a 10,000 square foot lodge. Stewart now hosts 1-day and 3-day courses every year from May until November and said he serves a huge range of attendees, from 10-year-olds to 80-year-olds. The approach at Willow Haven is somewhere in the middle in terms of intensity and Stewart said he’s developing a niche for instructing families. “There’s one extreme where people come to a survival course and expect to strip down to a leather thong and only take their knife into the woods with them for seven days and starve, then there’s the classroom survival stuff — we’re perfectly in the middle,” he said. In a typical class, students will receive hands on instruction to learn between three to five survival skills from each of the core four survival areas. Our “Badass Dad” Father’s Day Giveaway wrapped up today and just a few minutes ago we randomly chose a winner from our 108 entries. Congrats to Kerwin Dyson, who is getting hooked up with a Smith and Wesson assisted opening S.W.A.T blade for himself and a Bear Grylls multi-tool for his Dad. Kerwin, shoot an email to Dan@knife-depot.com with your mailing address to claim your prize. Thanks again to all the Knife Depot fans who entered the contest. May you have a happy Father’s Day and may you NEVER LOSE YOUR EDGE! Knife Depot COO Waren Sager and his son, Ian. 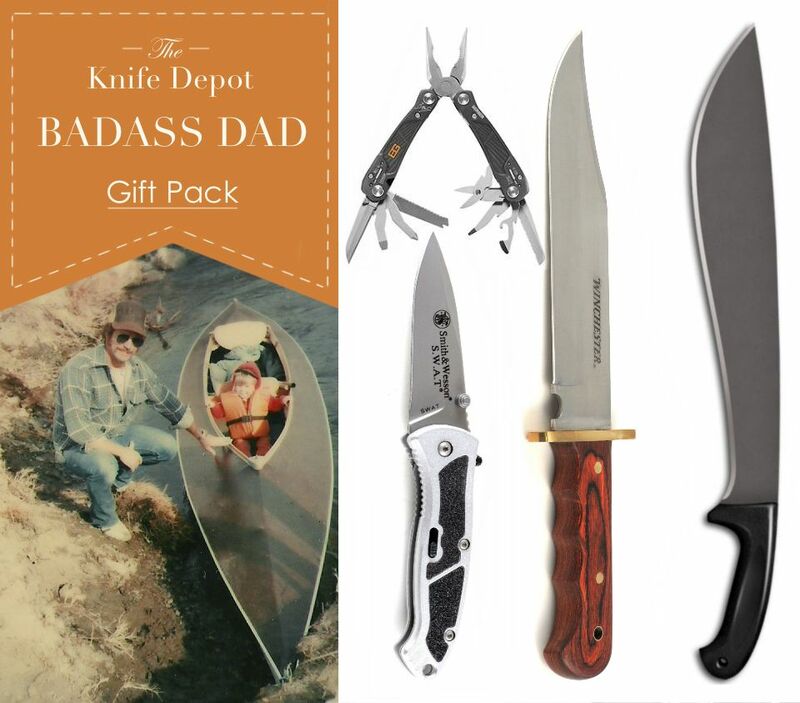 At Knife Depot, we know that Father’s Day represents a great opportunity for connection between father and son. Recently, I was able to talk to Warren Sager, Knife Depot’s Chief Operating Officer, about his experience passing down his first knife to his son. DL: Tell me about your first knife. How did you get it? WS: I got it out of “Boy’s Life” when I was 10. This was about 30 years ago when the back of the catalogue was full of ads. I was in Cub Scouts at the time and in the back of the magazine I saw this ad for this really awesome survival knife. In the handle, it had all sorts of additional survival materials as well, so I really wanted it. I saved up the money and then I waited. WS: Well, then I waited some more. Remember, this is pre-Internet, so I had to wait for my money order to get there and then had to wait for weeks for it to arrive. The anticipation drove me crazy. Finally the package came. What to get dad for Father’s Day? It’s an age-old question, and the answer is usually totally lame. A coffee mug or tie rack aren’t exactly earth shattering gifts, especially for a badass dad. That’s why this year Knife Depot is giving you the chance to hook up your dad with one of our bestselling knives for father’s day. You can also win a knife for yourself. All you have to do is leave a comment on this post with your two picks from the selection below (one for you and one for your dad) by 12 pm CST on Friday, June 7. We’ll pick a winner that day. 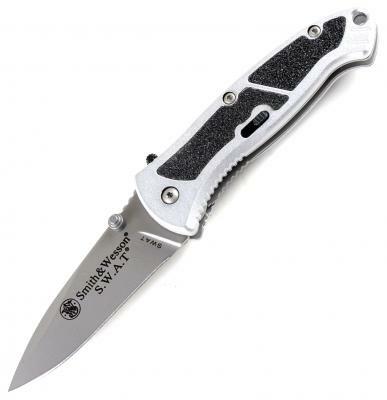 This sleek assisted-opener from S & W has a 2.8 inch blade and is great for everyday carry. Check out the rest of its specs here. 14.25 inches of badass Bowie knife steel. This rocking blade will get you or your pop some instant respect. Here are the full specifications on this monster. 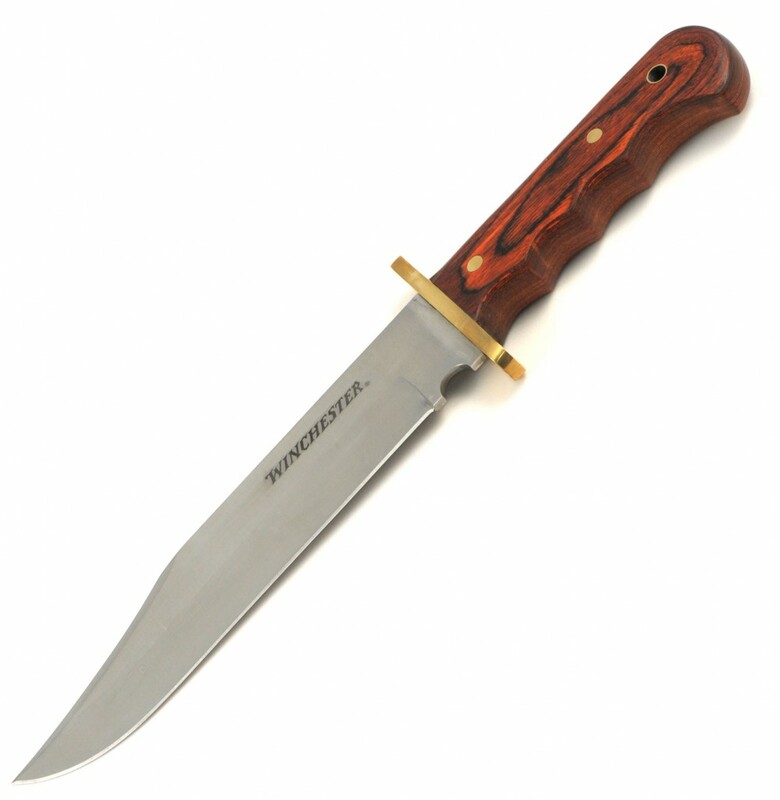 We’re talking 16 inches of 1055 Carbon Steel ready to bushwhack its way through any situation. The Cold Steel Jungle Machete is certifiably badass, check out more of its specs here. I started out the day chatting with Creek Stewart, survival instructor and author, about what he looks for in a survival blade. Creek’s survival knife of choice is the Blackbird SK5 from Ontario Knives, which he was sporting in a sheath from Paul Schaffer of Hedgehog Leatherworks. In addition, he was carrying a Spyderco folder and a pretty burly leatherman. Creek had tons of good tips on picking out a good survival knife for every day carry. A couple of his fundamentals were making sure your knife is a fixed blade, has a full tang and a heavy duty pommel. We’re going to post a full-length interview with Creek later this week, but you’d be well advised to scope out his survival school in Indiana if you’re looking for an awesome spot to brush up on your survival skills. For over 30 years, Corrie’s been making awesome knives and he showed us some pretty fantastic Damascus steel blades. Corrie uses a lot of really exotic handle materials. Just from his knives on display, he had handles made of mammoth tooth, cape buffalo and (pictured below) kudu antlers. For those who aren’t in the know, the kudu is an African antelope that, according to Corrie, can jump six feet in the air. 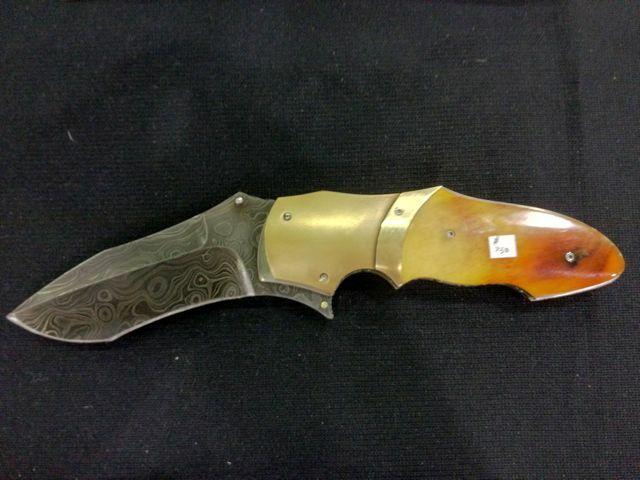 I was just kind of stumbling about lost in the frenzy of sheer knife power, when the Red Blade Knives booth caught my eye. These are some of the burliest folding knives I’ve ever seen. The pig ( pictured above) is 1/4″inch and made of CPM S30 steel, with titanium liners. 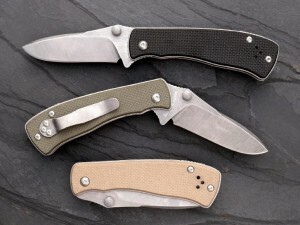 Red Blade Knives is run by Dan Rotbaltt, Robi Mukherjee and Sean “Griz” Coulter. Rob, a veteran, said that one of the motivations for developing these knives was to create the sort of knife a solider would need, tough enough to take just about any sort of abuse. From a cursory glance, I’d say these blades are at that level. 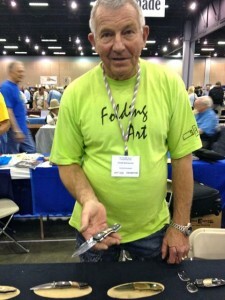 That’s my quick and dirty rundown from today’s Blade Show. Tomorrow, we’ll be checking out a bunch of awesome seminars and covering the World Cutting Contest, so stop by for more updates. March 6, 2013, may have been the most newsworthy day for pocket knives in history. On that date, the Transportation Security Administration (TSA) announced that it would be allowing small pocket knives (under 2.36 inches) on planes. The policy change, which brought the U.S. in step with regulations across most of the world, was seen by knife owners as not only a personal victory, but also a step toward a more sensible and effective policy for TSA. In addition to allowing small knives on a plane, the rule reversal also meant that individuals would be permitted to carry hockey sticks and golf clubs on board. TSA officials cited the low risk of these items to passenger safety and the time-consuming task of searching for them as the reason for the policy change. “The focus is on what could present catastrophic damage to the aircraft,” said David Castelveter, a TSA spokesman. The rule change, which was result of significant lobbying by knife advocacy groups such as The American Knife and Tool Institute, was quickly the target of harsh criticism from a number of different groups. The most vehement objection came from the Association of Flight Attendants (AFA), who characterized the decision as one that makes both airline employees and passengers less secure. 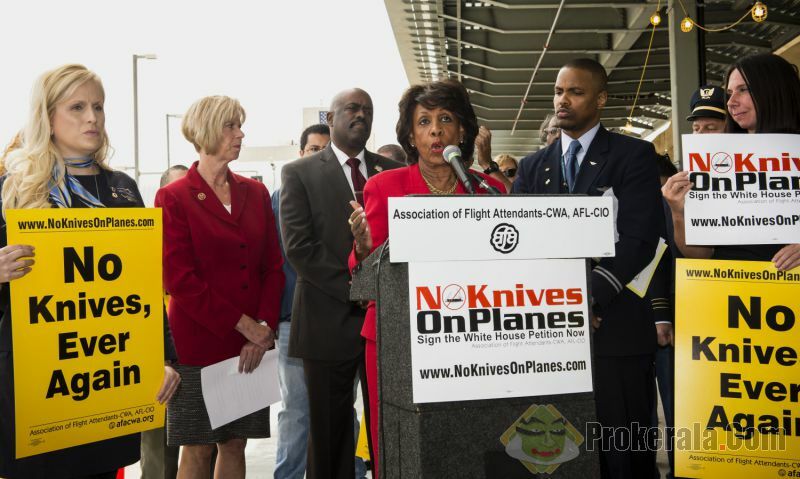 Member of Congress from both parties also vowed opposition to allowing knives on planes. New York Senator Charles Schumer blasted the decision in a radio interview with a local station. “You don’t have to have a PhD in physics, you don’t have to be Albert Einstein to know that these items are dangerous.” he said. While the AFA and other organizations decried the decision, a number of transportation safety experts, journalists and policymakers supported the change. In a article for the libertarian publication Reason, J.D. Tuccille, blasted the AFA for its opposition. Tuccile noted, as many others had, that there were a number of other equally harmful, if not more dangerous items that would be allowed in board, but weren’t drawing the same criticism. I hesitate to point this out for fear of sending the flight attendants’ association into an organizational panic, but the same TSA notice allowing for small knives also allows novelty bats, pool cues and golf clubs. Honestly, in a bar fight, I’m reaching for the pool cue, not my Leatherman micra. It’s also been pointed out by many that TSA currently allows pointed scissors with blades up to four inches long, knitting needles and screwdrivers as long as seven inches, and glass bottles, all of which can easily be transformed into a deadly weapon. Lastly, many cited the fact that since all cockpits are now fortified, it would be impossible to hijack a plane using a pocket knife. It appeared that, despite the opposition, TSA would go ahead and begin allowing pocket knives on planes starting April 25. Yet, on April 23, two days before the new rule would go into effect, TSA announced that it would delay the change while considering additional input from airline companies, passenger advocates and other stakeholders. Many suggested that in addition to the backlash, the recent bombing at the Boston Marathon may have also swayed TSA to move more cautiously. 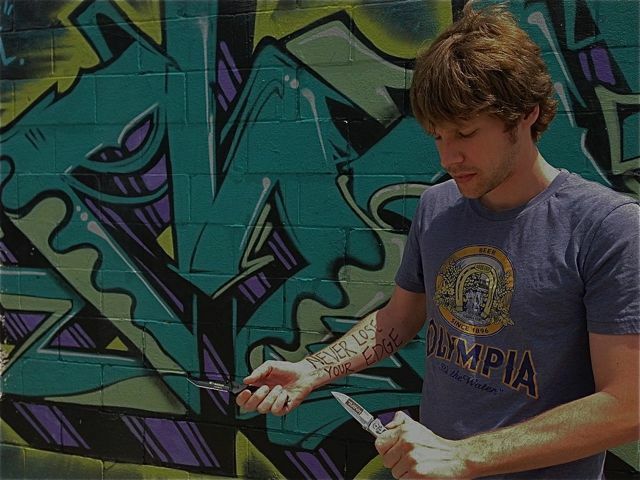 Meet the New Knife Depot Community Manager and Win Badass Knives! I’d like to take a second to reintroduce myself. For the last two years, I’ve been blogging for the Cutting Edge. In fact, I founded this blog in 2010. The initial name was actually the Happy Dagger. That’s a Bill Shakespeare reference, in case you’re not aware. Anyway, I have a confession to make. The reason I started blogging for Knife Depot wasn’t because of my love for knives. It was because, like most people writing on the Internet, I was a copywriter. In fact, I wasn’t just writing about knives then, but about all sorts of subjects like: birdfeeders, picnic baskets, temporary tattoos, seafood restaurants, wedding planning and even bankruptcy law in Arizona. It wasn’t a bad gig — I could do it in my underwear — but some of these subjects just left me feeling a little thin. I quickly noticed that most of my best writing was about knives, because they truly fascinated me. The guys at Knife Depot started sending me boxes of them, which was pretty badass, and I’d use them when I went camping with my friends. You see, the thing about working as a writer is that you have to spend lots of time behind a computer typing when all sorts of kickass, beautiful stuff is going on outside in nature. It can be kind of a bummer. The knife was my only link to the tangible world. It was a rugged product that reconnected me with nature in a way I was missing. Over time, I became intoxicated by the power of the blade. And why wouldn’t I? It’s the world’s oldest tool, suffused with a deep religious, historical and cultural meaning. It was used by Roman craftsmen, Native-American hunters and frontiersman like Jim Bowie and Daniel Boone. It turns out that over at they Knife Depot office they noticed my zeal for the knife, which is why a few weeks ago they invited me to central headquarters to discuss working full time for the site. As you can expect, I was a little bit nervous. These guys don’t just rock one EDC: they are a walking arsenal of stainless steel. Their offices have more Bowie knives then paper clips.